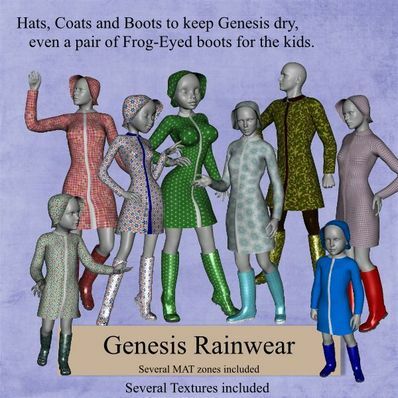 Hat, Coat and Wellie Boots for Genesis for use in Daz Studio 4. Mainly for the girls and children, but the men can wear them too. There are no buttons etc on the coat as I haven't yet worked out out to do the Rigidity zones yet! The buttons I added to the coat just disappeared when the smothing modifier was applied, so I removed them. Make sure Genesis is in the zero pose before adding the boots. Do NOT use the Smoothing Modifier on the Boots as they will distort! Thanx for your wholge work!!! Thanks again for another great product! In the rain , with your models, it's more beautiful ! Thanks so much! All your items are great! Great rainwear, love the rain boots as well. Thank you.